Keep close a reminder of your Christian faith in the Trinity with this beautiful white gold cross pendant from Apples of Gold Jewelry. This pendant is crafted from high quality 14K white gold for that radiant glow. This pendant features a simple shape with just enough design elements to make it fashionable. The outline of the cross is given a smooth, high polish for a little bit of shine. The inner portion of the cross pendant is slightly subdued that works wonderfully with the shining borders. 22mm x 16mm (7/8" x 5/8"). 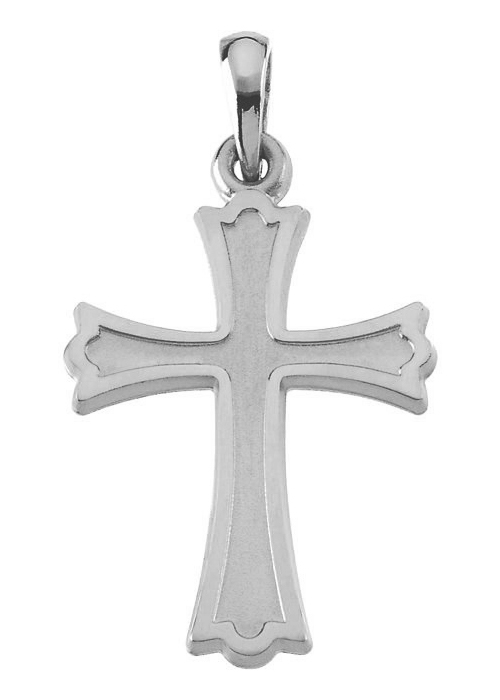 We guarantee our Trinity Cross Pendant, 14K White Gold to be high quality, authentic jewelry, as described above.